Dive Journal: The tidal swing is again about 18' today and so we time the dive to coincide with 5 minutes prior to the scheduled high tide. 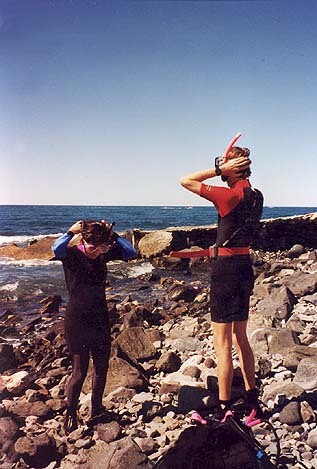 The entry is a bit tricky with some smallish waves plus the shoreline rocks, and so we are patient in entering the water. The visibility is not very good today but there is plenty to see. There is a great chocolate-chip starfish here and several other species of starfish, too. Dave, Linda, and I have brought hot dogs with us, and we feed them to the friendly cabrilla on the sand flats. There are a great number of other wrasses and porgy-like fish as well. There is a pair of beautiful Cortez angelfish near the exit. This site is more exposed to the tidal currents, but we feel only a slight tug into the harbor during the dive. I am impressed with Dave's ease and comfort in the water after such a long absence from scuba.